There are many schools of thought when it comes to conditioning show horses. Some people believe that interval training is the way to go. Others feel long, slow, distance work is best. Whatever works for you and your horse are paramount. As with any training technique it’s about trial and error. It is best to do as much research as you can and then start with an educated idea. There are two types of exercise your horse gets in a workout, aerobic and anaerobic exercise. Aerobic exercise is the type of exercise where oxygen burns carbohydrates and fat to create energy. It is used to build endurance through increased heart rate and respiration. Think jogging for humans and trotting for horses. Anaerobic exercise uses oxygen to burn carbohydrates to produce energy. It is to build muscle and physical strength through short, quick bursts of action. It creates lactic acid, a breakdown of sugars in the body, which causes muscle fatigue. Think sprints or galloping at a race. There are some sports that require the use of both such as, Polocrosse where your horse might be walking and trotting, but then sprinting to the other end of the arena. 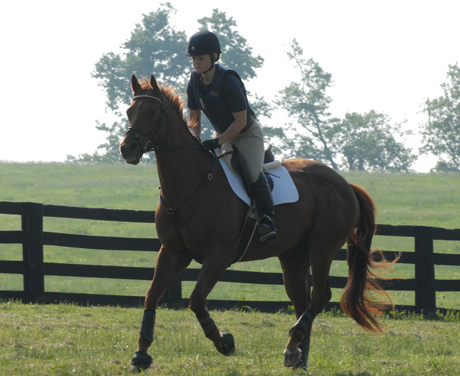 Endurance riding is the epitome of using both aerobic and anaerobic exercise. Horses are asked to sprint in the beginning and end of the race, but spend a lot of time trotting throughout the middle. As stated before, research is important. It is also imperative in any fitness program to know your horses resting temperature, respiration, and heart rate (pulse). For anyone who doesn’t know the resting temperature of most mature horses is 99-101 degrees. The resting respiration is 8-12 breaths per minute, and the resting heart rate is usually between 32-44 beats per minute (bpm). Any time you start fitness with your horse you should check their vital signs so you always have a beginning point. 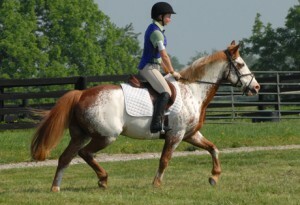 Each time you take your horse out for trot and gallop sets you should take a resting TPR and also a finishing TPR. This will give you an idea of how well your horse is responding to his/her fitness work. It is important to remember your horse will best benefit from a gradual building of endurance. It can take up to 12 weeks for a horse to reach peak fitness. Each week you should increase your length of trot and/or canter sets according to the current and previous data about how well your horse is recovering. Over-conditioning and under-conditioning can be detrimental to your horse’s health. If you notice after many weeks of fitness work his health or his recovery times start to decline, then take a step back and re-assess your program. You don’t need a fire-breathing dragon to take on a 2’ jump course, but you also can’t just pull a horse out of a field and expect him to be able to run a Preliminary Level event. Some trainers believe interval work is best for the horse. This means on trot set days that the horse who has been in work for a couple of weeks might do 15 minutes of trot broken into 3 sets with a 2 minute walk in between each or 5 X 2 X 5 X 2 X 5. While this is a form of aerobic exercise and works well for some horses and riders, others believe it doesn’t keep the horses’ heart rate high enough for long enough to really add fitness. With each of these scenarios, there are good and bad ideals. They are only regarding trot work because it is widely known to be a good form of aerobic exercise. Most canter and gallop sets then become anaerobic exercise due to the amount of speed required and how quickly the horse uses energy. This is why canter/gallop sets are done much more infrequently in the training program. Jimmy Wofford once said, “I promise you will feel such a sense of pride and satisfaction when your horse finishes cross-country and says, ‘Is that all you got?’” This is a feeling we all want when finishing a competition. It means your horse is ready to fight another day. You will go home with a happy, healthy animal and in the competition world isn’t that what we all want?